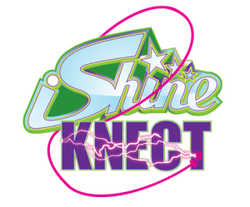 Ishine Knect is a Tween sitcom seen weekly by almost a million viewers on TBN, JCTV and Smile of a Child network. I co-wrote the sitcom element also known as the "Club iShine" part of the show. We wrote 13 episodes, but only had 12 filmed as production ran over time. The entire season was filmed over three weeks at the TBN studios in Nashville. You can stream the entire series now on Amazon Prime. They finally make it to the counter. Troy looks over the groceries with suspicion. From our show last night. You got paid in groceries? No, They're for Mr Bridges. Is he paying me in groceries? Only if you want me to. Mr Bridges walks over and inspects the boxes. We have more cases outside. Alexis and Cammie head out to get more food. Don't worry Troy, the cafe's safe. to the local food bank. Troy grabs a can of food from the pile. Frank and beans! In the same can. genius. Can I have these? Are you homeless or in need? I'm in need of frank and beans. Troy pleads for his frank and beans. Jonnie and Brookie walk in carrying their guitar cases. play a free show for the kids. Jonnie and Brookie grab their drinks and leave. Troy is lost in thought for a moment. ministry they do. Except for me. And Jasmine. Where is she anyway? where you can help others. You sir, are like frank and beans. Jasmine and Jamie-Grace sit at the counter. Troy walks in from the kitchen dressed for the beach. no worries kind of day 'eh mate? Troy slides a travel brochure across the counter. reef. That would be in Australia. That would be a vacation. and then he could find Jesus. really qualify as less fortunate. Troy holds up a pair of skis. The girls just shake their head. OK, fine. So where can I go? ever to go on my mission trip. world and some darts I can borrow? Jasmine and Jamie-Grace are seated at a table. Troy rushes in carrying a globe. Does anyone even live up there? from Canadian pond hockey players. interference, high sticking, holding, cross checking. As soon as I book my flight. Troy goes to the counter and dials the phone. dollars and sixty three cents? I have the sixty three cents. Troy holds up the bowling coupon. thousand dollar game of bowling? thermometer sign titled "Save the Zambonians". Mr Bridges is loading up the food for the food pantry. Troy whistles his finger down to the bottom of the sign. Jonnie approaches the counter with her bill in hand. Really, well let me take a look. Troy takes the bill and looks it over. that was free. Sales tax is here. can see is a thousand dollars. Jonnie stares at him in disbelief. Let me take care if this. Mr Bridges takes the bill from Troy's hand. Jonnie leaves shaking her head. pay for your mission trip. But, it's for a good cause right? There's a lot I can think of. serve others then what's the point. and forth between his hands. Jasmine cautiously approaches and offers Troy a coin. I'm sure God has a plan for them. It just doesn't include me. I guess I'll have to give it back. opportunity to help others too. food pantry for retired sick kids. What about building a house. Ahhh, help me. Why Troy, why? or stock a pantry, right? You ma'am, are a genius. Troy runs out the door. Mr Bridges is at the counter. Troy struggles to wheel in a dolly loaded with food. He finally makes it to the counter. Mr Bridges eyes the food with suspicion. Troy grabs a can from one of the boxes. dollars worth of Frank and beans. Troy pats the boxes of food. right here doing the little things.